These companies are already very successful, and are at the forefront of what they do individually. Collectively – through Jade Ireland Seafood they are now providing customers in China with an unrivalled range of live and processed seafood products. The companies are located around the coast of Ireland with access to with abundant well managed sustainable stocks of high quality seafood – harvested from the pristine cold unpolluted waters of the Atlantic Ocean and the Irish Sea. The three companies own a fleet of fishing vessels, and four world class packing and processing facilities – the integrated nature of the companies, with complete quality control over the supply chain, results in seafood which is caught and processed quickly, ensuring that only high quality, delicious seafood is supplied onto the market. This control of the supply chain also means that Jade Ireland Seafood can provide customers with complete traceability, and continuity of supply – maintaining supply all year round. processed crab, lobster, mussels, prawn, scallop, razor clams, whelk, smoked salmon, smoked mackerel and white fish. The group is a recognised leader in seafood new product development and innovation – in handling systems, packaging, processing; and this expertise has been rewarded with many seafood awards – for technology, processing, and marketing. Jade Ireland Seafood has the strategic vision to establish Irish seafood as the leading premium quality seafood in the Shanghai, Dalian and Qingdao regions of China – sold under the Ocean Jade brand. Jade Ireland has established a sales office in Shanghai to service it’s growing list of customers in these areas of China. In 2017 Jade Ireland Seafood Ltd received funding of €60,000 from the Seafood Scaling and New Market Development Scheme. The project was part funded by the Irish Government and the European Maritime and Fisheries Fund under the Seafood Capital Investment Scheme and was administered by Bord Iascaigh Mhara (BIM), Ireland’s Seafood Development Agency. This investment will allow Jade Ireland Seafood Ltd to continue to grow it’s exports in China, Hong Kong and Taiwan and increase employment in member companies. 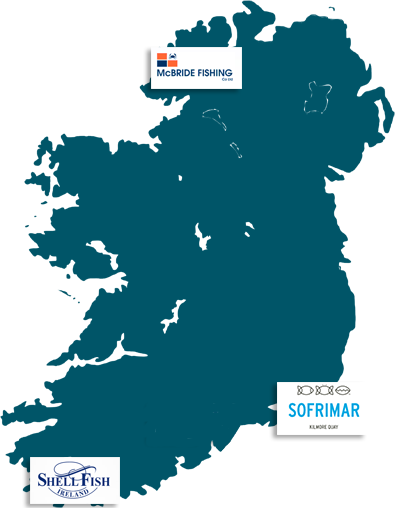 Sofrimar is one of a number of companies that will receive funding under the European Maritime Fisheries Fund (EMFF) in 2017. The overall funding programme which runs from 2014-2020 was adopted by the European Commission in December 2015 and launched in January 2016 by the Minister for Agriculture Food and the Marine. The Programme provides €240m in funding to the seafood sector (fisheries, aquaculture and seafood processing) over the period 2014 to 2020. The Programme is co-funded by the Exchequer and the EU.